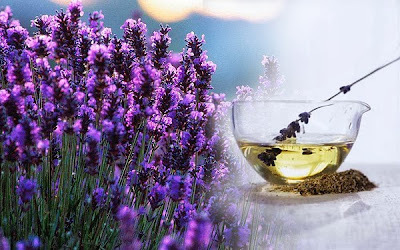 I love Lavender. Always have and always will. In fact I love it so much I have four bushes planted under my office window where the lovely scent from this herb fills the air throughout the summer and into the fall. 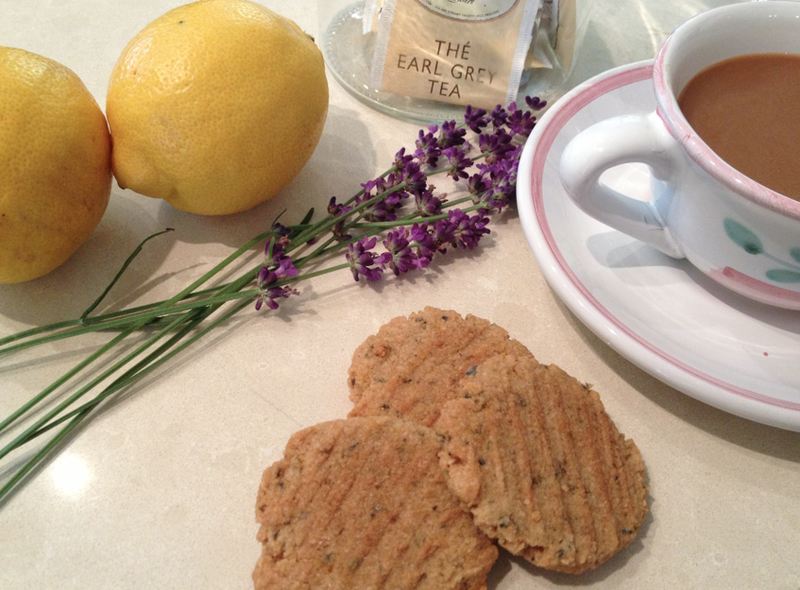 I also love Earl Grey tea, which has a wonderful citrusy lavender aroma. 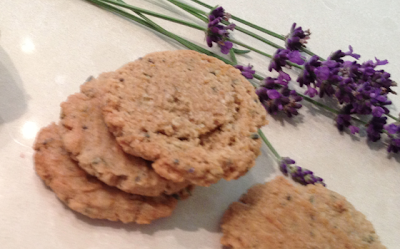 So when I was thinking about making some cookies to go with my afternoon tea, of course the first thing I thought about was using some of the dried lavender I harvested this summer from the bushes in my garden. The next thing was finding a recipe that was gluten-free, and since I love all of Elana's books, I decided to try the one she has on her blog. Unfortunately her timing doesn't seem to work for me. I don't know why, but it could be my location verses hers. I know sea-level does affect cooking times and maybe that's what the problem is, but when I follow her directions my baked goods always come out undercooked, and this seems especially true of cookies. So I played around with her recipe and came up with a version of my own that I think is just right. Slightly chewy on the inside and crispy and crunchy on the outside, this is the perfect accompaniment for a warm cup of tea, regardless of your favourite brand. Melt the butter or ghee in the microwave, then add the sweetener and mix until blended. 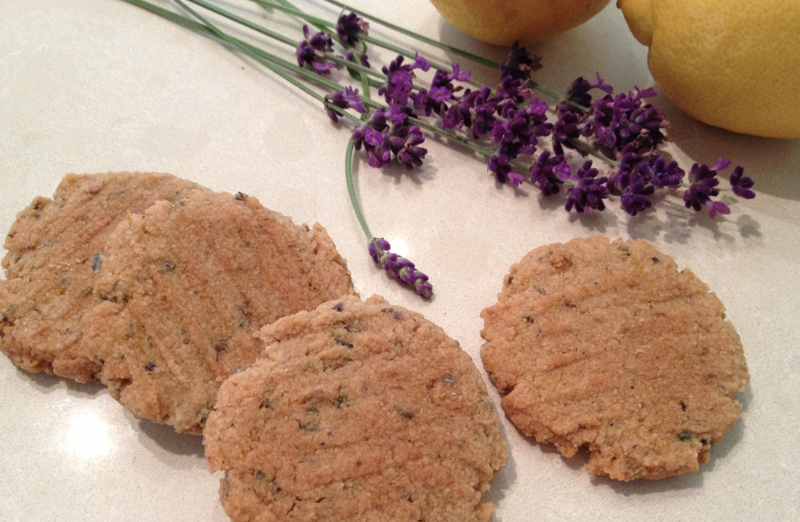 In a large bowl combine the almond flour, salt, baking soda, lemon zest and lavender. With a small ice cream scoop or a large tablespoon drop balls of the batter on a parchment lined baking sheet. Press with a fork or the back of a spoon to thin them out. Bake for 10 minutes, then remove from the oven and place the baking sheet on a wire rack - preferably in front of a window - where they can cool for 5 to 10 minutes or until they don't break when handled. Flip the cookies over so you can cook the underside, then bake for another 10 minutes. Remove, cool on the baking sheet for 10 minutes, then remove to the wire rack and cool completely before storing. This will make 2 dozen medium-sized cookies. To keep crisp, store in a cookie jar rather than an air-tight container. These cookies will also freeze very well should you decide to keep some for later.